If you happened to wander accidentally onto Madison College campus on the morning of Saturday November 9, you’d be excused for believing you’d stumbled into a giant middle school summer science camp. Teams of kids, aged anywhere between 7 and 14 wearing coordinated team t-shirts had the run of the place, putting finishing touches on their elaborate science project displays and robotic creations. Scattered across several locations around the campus, and providing a focus for the milling masses of hundreds of kids, their parents, coaches and spectators were several ping-pong sized tables, each one with an identically laid out obstacle course built entirely out of LEGO® bricks. From time to time a team of kids was summoned by a referee, and the real excitement began. On getting a “thumbs up” from the team, the referee would set off a buzzer – the team, made up of anywhere from two to ten kids, would run up to the table. A couple of the kids set their robot – built around a LEGO® Mindstorms® “smart brick” – down nervously but quickly in a designated corner. One kid checked that the proper attachments to the robot were in place, the other verified that the right program was dialed in. They aligned their creation carefully on the table, and hit a big orange button on the body of the robot to launch it. The robot then trundled away – on wheels or treads depending on how the team conceived it – and pushed toy LEGO® trucks to designated zones on the board, wrecked some LEGO® buildings while carefully raising others above an imagined flood, rescued little LEGO® minifigs, and reunited LEGO® family members with each other and with their pets, also built of tiny LEGO®s. The robot returned to its home base as often as needed where the kids could tinker with it, switching out attachments and programs. Two and a half tense and breathless minutes after starting, the second buzzer sounded indicating the end of the round, and the team would erupt into a spontaneous cheer as its results were announced by the presiding judges. Gone are the days when the phrase “educational TV” would inevitably send shudders of dread through kids and teens. Quite the contrary, many of today’s educational programs are fast-paced, expertly narrated and full of surprising, fun, and visually engaging facts and science trivia. But while no doubt entertaining, are these programs still any good at their core function, namely teaching the kids actual concepts useful for understanding modern science? To celebrate the release of iOS 7 and the new batch of iPhones, I’d like to share some highlights in the life of a mobile developer at Promega. Promega was quick on the uptake when the iPhone was first released, and immediately spotted a unique opportunity to reach out to scientists in this new medium. A project quickly coalesced to create an iPhone app that combined the Protocols and Applications guide, easy access to our multimedia library, and the most popular Biomath Calculators. Promega thus made news as the first biotech company to release a resource-rich mobile app. I, like many other developers, fell into writing code for smartphones and tablets almost by accident: When the iPad made its appearance in 2010, I was asked to see what it would take to make a version of the app for the then-brand new tablet from Apple. As a freshly hired graphic designer with a background in computer science, I thought, I’d really just be creating the user interface for the tablet version of the app, and the programming can’t be all that involved, can it? The app’s already written, I’m just effectively re-potting it, right? Also, the practice of programming had changed significantly since my college days: documentation could easily be found online and extensive online communities of programmers, such as stackoverflow.com, now provide excellent peer support. Warning: This blog post deals with mathematics, but not the math you may remember from school. But by virtue of it being mathematics, some people may be tempted to skip over this post. Don’t let this happen to you – there’s too much wonder here to miss out on. Warning 2: The websites mentioned here use WebGL interactive 3D graphics: They only display correctly on browsers that support WebGL, such as Google’s Chrome browser. If you haven’t already done so, consider losing yourself for a few hours in the chrome experiments website. Back when I was a mathematics graduate student in the early 1990’s, I felt that I had to sift through tomes of tedious formalism and obtuse notation to get at the few rare jewels of genuine mathematical insight. Or so my memory tells me. Then again, I also remember having to trudge uphill both ways through monstrous snow drifts to get to classes, so I can’t quite vouch for my memory (actually, that last part may have been somewhat true of the math department at the UW Madison, in the winter at least). In any case, my sense of mathematical wonder ebbed, and I eventually turned to the pursuit of more tractable goals, like finding a decent job and starting a family. In effect, I had built a mental wall between me and mathematics. Analog is the new digital? I am reminded daily that we live in an age of wonders. To find out where somebody lives, I plug in their address into any one of a number of mapping web applications, and instantly see their neighborhood, detailed satellite views, driving directions, even gas stations nearby should I need to stop by one. I can similarly figure out who people are and how I’m connected to them with a variety of social networks, and all these data are delivered painlessly: No flipping through gargantuan phonebooks, no need for obscure incantations to formulate database queries. Scientific visualization has been catching up in fits and starts to this new world of ubiquitous and trivially accessible relationship data. This is partly due to the inherent complexity of scientific data, and partly due to the vastly smaller user base that would benefit from such an endeavor, and the limited resources available to researchers. There are certain scientific datasets, however, that are eminently suited to benefit from this new visualization paradigm. Consider the phylogenetic tree of living creatures: representing how different species are related to each other. Long ago in school, for example, I was taught that tetrapods (vertebrates, except for the fishes) were grouped into amphibians, reptiles, birds and mammals, pretty much in that order and with very little sense of how little or much diversity each of those groups encompassed. 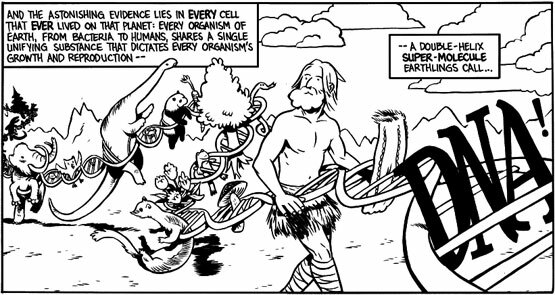 Since then, genetic sampling has revolutionized our understanding of the tree of life. However I’m pretty confident that kids are still taught about amphibians, reptiles, birds, and mammals, in pretty much that order. Perhaps somebody mentions that the dividing lines aren’t quite as clear-cut anymore, but that probably just muddles things even more. Our experimental setup: Microbe plushies, Lego DNA, plates, iPhones and makeshift stand, ready to go. A few weeks ago, our elementary school held its annual science fair. Owing to the greater-than-usual number of scientists among the parents, the halls of this event were lined with tables staffed by said parents, showing off the wonders of science, tech, and especially biotech. There were at least three stations devoted to various aspects of stem cell research, and the table next to us had kids run simple nucleic acid extractions from wheat germ using detergent and alcohol – my son loved that one, as he pulled out the stringy goop with a q-tip at the end of the process. My wife and I contributed to the festivities by putting together a presentation on bacterial transformation. I was just about finished working on a colony counter iPhone® app for Promega, so I figured why not try it out in the field: Print out some colorful ersatz bacterial plates, have the kids count the colonies using the app (yay, touch screens!) and maybe teach them something about genetic engineering along the way. Last week I attended VIZBI 2013, the 4th international conference on visualizing biological data. I was wowed by the variety of visualization techniques and tools presented, as well as by the high quality of art and design I saw on display . The conference covered a diverse range of visualization problems, from pure data visualizations of genomic, expression and even epidemiological data, to renderings of biological structures at various scales. One of the posters presented at the conference that really impressed me showed off the entries for a contest, just finished, to render artistic visualizations of HIV in blood serum.